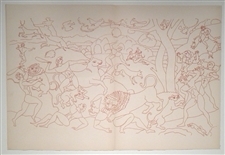 Medium: lithograph (after the tapisserie). Printed in Paris in 1947 by Mourlot Frères in an edition of 270 for the very rare "Derain Dessins" portfolio, published by Georges Duval. The total sheet measures 19 1/4 x 28 1/2 inches (490 x 725mm) with a fold in the center, as issued. A fine impression on Arches wove paper with deckle edges. Condition: there are some handling creases to the paper. Not signed. Medium: lithograph. Printed by Mourlot and published in Paris by Teriade for Verve (Volume 1, Number 5-6), in 1939. Verve was founded in 1937 to showcase original prints by the leading artists of the day, with outstanding technical quality. Image size: 10 x 7 3/8 inches (253 x 188 mm); the sheet measures 13 3/4 x 10 inches. There is another lithograph printed on the back, as issued. Not signed. Condition: there is some discoloration in the margins. Medium: lithograph. Printed by Mourlot and published in Paris by Teriade for Verve (Volume 1, Number 5-6), in 1939. Verve was founded in 1937 to showcase original prints by the leading artists of the day, with outstanding technical quality. The image size is 9 1/2 x 7 inches (245 x 180 mm) and the full sheet is 13 3/4 x 10 inches. There is another lithograph printed on the back, as issued. Not signed. Andre Derain lithograph "Le Port de Collioure"
Medium: lithograph (after the painting). Printed in Paris by Mourlot Freres in 1964 for a scarce catalogue. Size: 10 x 8 1/4 inches (255 x 210 mm). Not signed. Condition: there is some age-toning. Medium: pochoir (after the gouache). This magnificent pochoir shows Salome performing the Dance of the Seven Veils, from Oscar Wilde's "Salomé". It was printed in 1955 by l'Imprimerie Nationale de Monaco and published by Fermiers Generaux. Sheet size: 8 x 5 1/2 inches (203 x 140 mm). A rich and beautiful impression on black Supralfa Cellunaf laid paper. Not signed. 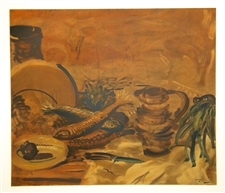 Medium: pochoir (after the gouache). This magnificent pochoir shows Salome asking Herod for the head of John the Baptist after performing the Dance of the Seven Veils, from Oscar Wilde's "Salomé". It was printed in 1955 by l'Imprimerie Nationale de Monaco and published by Fermiers Generaux. Sheet size: 8 x 5 1/2 inches (203 x 140 mm). A rich and beautiful impression on black Supralfa Cellunaf laid paper. Not signed. 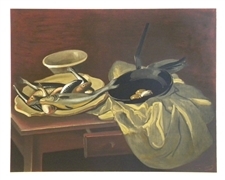 Medium: pochoir (after the gouache). This magnificent pochoir shows Salome with the head of John the Baptist, from Oscar Wilde's "Salomé". It was printed in 1955 by l'Imprimerie Nationale de Monaco and published by Fermiers Generaux. Sheet size: 8 x 5 1/2 inches (203 x 140 mm). A rich and beautiful impression on black Supralfa Cellunaf laid paper. Not signed. Medium: pochoir (after the gouache). This magnificent pochoir illustrates a scene from Oscar Wilde's "Salomé". It was printed in 1955 by l'Imprimerie Nationale de Monaco and published by Fermiers Generaux. Sheet size: 8 x 5 1/2 inches (203 x 140 mm). A rich and beautiful impression on black Supralfa Cellunaf laid paper. Not signed. 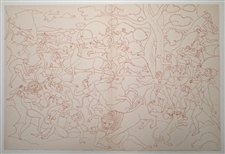 Andre Derain lithograph "In the Garden of Allah"
inches (355 x 260 mm). 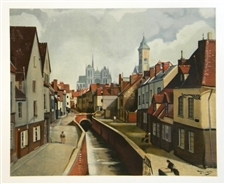 There is another Andre Derain lithograph printed on the back, as issued. Not signed. Medium: lithograph. Published in Paris by Teriade for Verve (Volume 1, Number 4), in 1939. Verve was founded in 1937 to showcase original prints by the leading artists of the day, with outstanding technical quality. The image measures 9 x 6 1/4 inches (230 x 155 mm); the full sheet is 14 x 10 1/4 inches (355 x 260 mm). 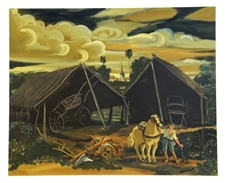 There is another Andre Derain lithograph printed on the back, as issued. Not signed. Medium: lithograph. Published in Paris by Teriade for Verve (Volume 1, Number 4), in 1939. Verve was founded in 1937 to showcase original prints by the leading artists of the day, with outstanding technical quality. The image measures 6 1/4 x 5 1/2 inches (160 x 140 mm); the full sheet is 14 x 10 1/4 inches (355 x 260 mm). 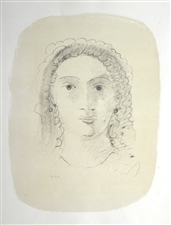 There is another Andre Derain lithograph printed on the back, as issued. Not signed. Medium: lithograph. Published in Paris by Teriade for Verve (Volume 1, Number 4), in 1939. Verve was founded in 1937 to showcase original prints by the leading artists of the day, with outstanding technical quality. The image measures 8 1/4 x 4 3/4 inches (210 x 122 mm); the full sheet is 14 x 10 1/4 inches (355 x 260 mm). 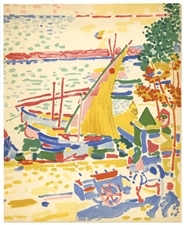 There is another Andre Derain lithograph printed on the back, as issued. Not signed.